Before we get into the tips, you need to define what “advanced Wing Chun” means to you. What's your goal? … What’s your real goal? Do you want a black belt, do you want to become an advanced Wing Chun fighter like a sifu or Pro fighter? Or do you want to be able to survive a true life or death encounter? Then ask yourself how much time you have and how much commitment you’ll give to reach your goal? To become a sifu or Pro fighter, as fast as possible, you have to train full-time. If you can't train full-time then it will take longer to reach these goals. If you want to quickly develop the survival skills needed to come out of a life and death situation alive, you have to train for that scenario and know the dibilitating and even life-ending strikes as well as the mental conditioning necessary. Whatever you choose aim to be the best Wing Chun fighter you can be based on your personal situation and be happy with that. If you’re like most martial artists I run across you probably don’t have enough time after work or in between family engagements to get to your kwoon each day and train. No problem. Here are some tips to help you be as effective on the street as possible with the time you got. The only way you’ll learn the advanced Wing Chun techniques is to keep training at the kwoon. Arm breaks, Biu Jee, knee strikes, Wing Chun weapons, the wooden dummy, Chi Sau ... you’ll learn all of this as you progress and your basic skills improve. But you got to stick with it, otherwise why would sifu care to teach you? To stick with it, you need to mentally commit to your goals. You need to buy in emotionally. The mental game comes first. Being mentally aware of your goals to be an advanced Wing Chun artist helps you focus and follow through. I spoke with a hypnotherapist once. She had a specialty helping people quit smoking. I asked her how she had such a high success rate? What she said surprised me. She said she “…stacks the cards in her favor”. The same goes for your advanced Wing Chun training. You have to want it first, then learning the techniques and developing the skills comes easy, and fast. Don’t take your imagination lightly. Dr. Maxwell Maltz in his best-selling book, Psycho-Cybernetics, calls it the “Theater of Your Mind” - use it. Olympic and world-class athletes have a very strict mental routine. They train their minds to see themselves successfully complete an entire race, in fine detail, and repeat this mental movie many times, dozens even hundreds of times before the actual race. What the mind imagines, the body delivers. By adding this to your routine (and it’s simple too because you’re just day dreaming with a purpose) you will improve very fast and with less effort. For instance, when you practice your drills in the air get emotionally involved. Imagine what an opponent looks like if he were standing right in front of you. It makes a big difference. And you can do this anywhere. I know Wing Chun students who practice at home when they can’t make to the class. Some train in their hotel room when they’re on a business trip or vacation. I’ve even played things back in my head while standing in line at a store. Now that’s dedication! Two great resources on how to run your brain better is Psycho-Cybernetics by Maxwell Maltz and Unlimited Power by Anthony Robbins. These will help you in each area of your life, not just Kung Fu training. You may not need to be able to run marathons to reach your goals. But at the same time, you can’t get winded by climbing one flight of stairs, either. You need good fitness and a cardio routine is the foundation. What I respect most about boxers is that they can outrun me. What I mean is… in Karate they have kata (forms), in boxing they have jump rope. If the other guy can outlast you, he can probably beat you. A great cardio exercise you can do almost anywhere is jumping jacks. Something else that’s easy for anyone is walking. If you can add in running, swimming, cycling, etc go for it. If you have concerns ask your doctor. Here's another easy fitness tip: do things… faster. Your household chores, walking, grocery shopping, washing the car, tending to the garden, weight bearing calisthenics… using a faster tempo gets the heart rate up too. One last thing about fitness, pay attention to what you put in your mouth. When you’re busy at work or with the family it’s too easy to make the more convenient but less healthy choices. Read the book Mindless Eating about why and how we eat more than we realize and how to stop it. Set yourself up for success, stock your home and pockets with wholesome goodness. You can’t be a very effective advanced Wing Chun fighter if you’re held down by excess fat. That’s as real and as safe as it’s going to get. You got to apply what you’re training, like finishing moves, in a realistic and free flow scenario. Sparring trains your senses, emotions and skills under high stress situations. It will quickly tell you what your strengths are and what weaknesses you need to fix. A real fight probably won’t last one minute; it’ll be over quicker in most cases. Sparring can last 5 minutes or longer at a time. If you don't have a lot of time to train and you want to improve quickly -- sparring is one secret to all levels of advanced Wing Chun artists, plus it can better prepare you for a real situation. Advanced Wing Chun artists aren’t just brutes. They think about what they’re doing, ask themselves why it works and how to do it better. You should do the same, but be careful not to get bogged down with analysis paralysis. Train and spar, then think. Train and spar a little different based on what you worked out in your head, then think some more. Elite military commandos do this. They train for a mission, do the mission, and then debrief. Tweak their training to do the next mission better, do it, debrief again. They use something called the Band of Excellence to always ratchet up their improvement and effectiveness. What's an Advanced Wing Chun Fighter Look Like? What is a Wing Chun Finishing Move? What are your Advanced Wing Chun tips? 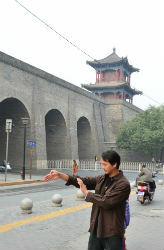 Do you have any advanced Wing Chun stories or a different point of view? Share it!